Darjeeling: The decision by the Indian Railways to shut down the heritage Railway printing press in Kurseong has invited flak. The Gorkhaland Territorial Administration (GTA) has written to the Railways for a roll back of the order. An order from the principal chief Materials Manager, Northeast Frontier Railway, dated July 20, 2018 read: "As per the order of Railway Board vide letter no. 2018/RS/PTG/STNY/AP/PP/IR, the Kurseong Printing Press is to be closed. Therefore, you are requested to notify the same for information of all concerned and take all necessary related actions accordingly and stop all printing and printing related activities by 1.07.2018. This has the approval of the Competent Authority." "We vehemently condemn the decision to close down the printing press, which is a part of the World Heritage Darjeeling Himalayan Railway. We have written to the Railways to roll back the order and instead modernise the press and preserve this world heritage," stated Anit Thapa, Vice Chairman, GTA. He also questioned the silence of BJP MP SS Ahluwalia (Darjeeling). "For how long can a MP remain silent? He is a part of the Centre. For how long will they remain lackadaisical on the issues of the Hills? Except for assurances they have not translated their words into actions yet," alleged Thapa. Incidentally, the press was founded in the 1950s and is still operational. It prints forms, passes, booklets along with Edmondson card tickets used for manual ticketing. There are 106 employees working at the press. "We have been corresponding with senior authorities for the cancellation of the order. It is a part of the world heritage and cannot be shut down. It is still operational," stated Ramesh Rasaily, an employee. They have also written to Chief Minister Mamata Banerjee seeking her intervention. The DHR was inscribed a World Heritage site on December 2, 1999. However, UNESCO experts have been constantly objecting to alterations and other violations that seriously threaten the heritage status of the DHR. Recently, the Railways had undertaken disposal of important objects and items of this printing press. NK Narzary, Director, DHR stated: "The printing press was never under the control of the DHR. It is under the stores department of Railways. Only the building belongs to the DHR." With the advent of computerised ticketing system, the Railways in 2008 had recommended the closure of 6 Ticket Printing Press (TPP) located throughout the country in a phased manner. However, in 2011, West Bengal Chief Minister Mamata Banerjee in the presence of the then Railway Minister Dinesh Trivedi had inaugurated a project for the modernisation of this press. Again in 2013, the Railway Board had sanctioned Rs 5 crore for the modernization of the same. On March 20, 2018, Ashwin Lohani, Chairman, Railway Board, during his visit to the district to take stock of the DHR had also visited the printing press in Kurseong. "All the important documents and stationery of the Railways is printed in this press. It is not just tickets," argued an employee. 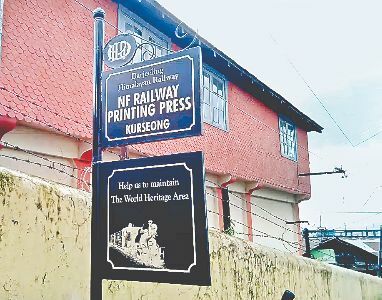 The decision by the Indian Railways to shut down the heritage Railway printing press in Kurseong has invited flak. The Gorkhaland Territorial Administration (GTA) has written to the Railways for a roll back of the order.